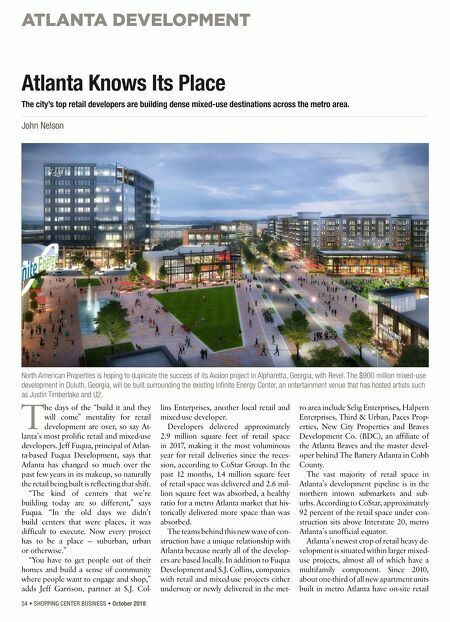 ATLANTA DEVELOPMENT 54 • SHOPPING CENTER BUSINESS • October 2018 T he days of the "build it and they will come" mentality for retail development are over, so say At- lanta's most prolific retail and mixed-use developers. Jeff Fuqua, principal of Atlan- ta-based Fuqua Development, says that Atlanta has changed so much over the past few years in its makeup, so naturally the retail being built is reflecting that shift. "The kind of centers that we're building today are so different," says Fuqua. "In the old days we didn't build centers that were places, it was difficult to execute. Now every project has to be a place — suburban, urban or otherwise." "You have to get people out of their homes and build a sense of community where people want to engage and shop," adds Jeff Garrison, partner at S.J. 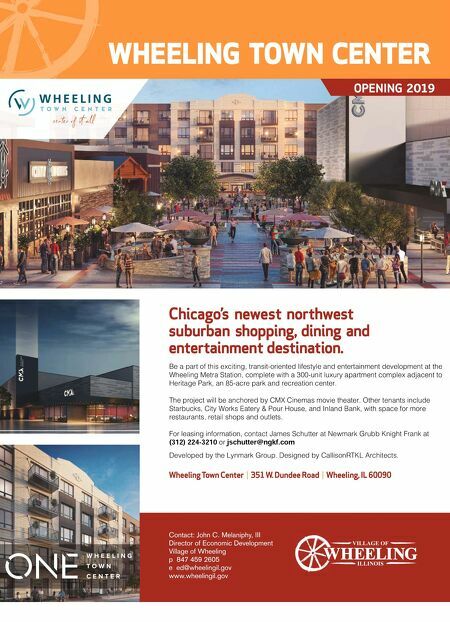 Col- lins Enterprises, another local retail and mixed-use developer. Developers delivered approximately 2.9 million square feet of retail space in 2017, making it the most voluminous year for retail deliveries since the reces- sion, according to CoStar Group. In the past 12 months, 1.4 million square feet of retail space was delivered and 2.6 mil- lion square feet was absorbed, a healthy ratio for a metro Atlanta market that his- torically delivered more space than was absorbed. The teams behind this new wave of con- struction have a unique relationship with Atlanta because nearly all of the develop- ers are based locally. In addition to Fuqua Development and S.J. Collins, companies with retail and mixed-use projects either underway or newly delivered in the met- ro area include Selig Enterprises, Halpern Enterprises, Third & Urban, Paces Prop- erties, New City Properties and Braves Development Co. (BDC), an affiliate of the Atlanta Braves and the master devel- oper behind The Battery Atlanta in Cobb County. The vast majority of retail space in Atlanta's development pipeline is in the northern intown submarkets and sub- urbs. According to CoStar, approximately 92 percent of the retail space under con- struction sits above Interstate 20, metro Atlanta's unofficial equator. Atlanta's newest crop of retail heavy de- velopment is situated within larger mixed- use projects, almost all of which have a multifamily component. Since 2010, about one-third of all new apartment units built in metro Atlanta have on-site retail Atlanta Knows Its Place The city's top retail developers are building dense mixed-use destinations across the metro area. John Nelson North American Properties is hoping to duplicate the success of its Avalon project in Alpharetta, Georgia, with Revel. The $900 million mixed-use development in Duluth, Georgia, will be built surrounding the existing Infinite Energy Center, an entertainment venue that has hosted artists such as Justin Timberlake and U2.